Foodies have an ally in the iPad — these apps give you great recipes, food-shopping help, and how-to information. One iPad app can even help you create cocktails to go with your feast. Epicurious is a recipe app “for people who love to eat.” It’s nicely laid out, easy to navigate, offers great photos of most of the finished dishes, and provides a shopping list feature that’s super convenient. It also offers user reviews, many of which have suggestions on how to tweak the recipes. And many recipes tell you a little about the chef who created it. Better yet, some recipes even have nutritional information! Grocery IQ is, at its heart, a grocery-store-shopping-list app. 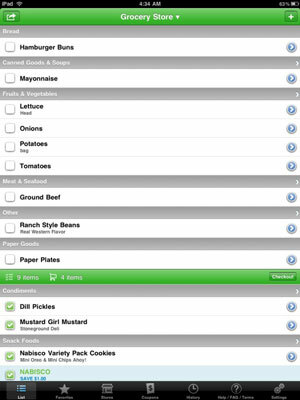 It includes a database of items and an awesome coupon system, and you can synch lists with other Grocery IQ users. With list sharing, you can invite other users to share your list when you’re shopping as a team. When any participant checks off an item, it’s checked off on everyone else’s list, too! List sharing requires accepting Coupons.com’s terms of service, and that means there’s one more party with access to some of your information. If this bothers you, don’t register and don’t use list sharing. This app has a lot of recipes for grilling and BBQ-ing, and those recipes have gorgeous pictures and easy-to-follow directions. But you can also find a series of How-To’s that covers everything from grilling basics to individual cooking techniques. The How-To’s are a combination of step-by-step instructions and photographs for each step. If you’ve ever wondered how to peel a shrimp or how to use a chimney starter, you’ll find more than 100 How-To’s that answer those questions and many more. 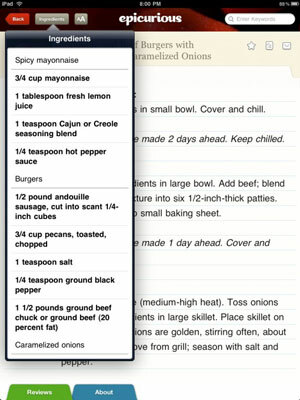 This app serves as an iPad-interface for BigOven.com, a recipe-and-cuisine Web site. There are more than 170,000 recipes available, and the iPad version of this app offers a great way to browse all that content. You can rate each recipe, and there are features like Try Soon Recipes, the Leftover Wizard, What’s for Dinner, and the Random Recipe. A free version is ad-supported, and a Pro version adds such features as a grocery-list generator, a log of recipes you’ve made, a food glossary, and more. Finding a store that specializes in organic and other health foods can be hard — especially when you travel — but Health Food Store Locator can change that. It uses Google Maps to find only the stores in this category, and you can filter the results by proximity to your location or a particular zip code. This app isn’t particularly pretty, but if you want an easy way to find a health food store, it’ll do the trick. This app is a fun way to find alcoholic drink recipes, especially at parties. The main feature is a randomizer — Push the Shake button to get a random drink, complete with a photograph, ingredients, and directions. You can also browse by Taste, Spirit, or Name, and you can set the measurements to be either Imperial (by the ounce) or Metric. With 62 recipes, the only thing it needs is more recipes.